Photo above: P&Z Commission members seated for the crematorium “work session” are all but Sandy Foreman, second from right. Also Lou Valenti was seated for the work session but is not in the photo. Left to right are Commissoners: Don Brown, John Lennon, Bob Legnard, Chairman Pat Rist, Kitty Grant, Sandy Foreman and Earl Finch. Bethel residents and business owners were victorious last night, in their 2-year quest to stop a crematorium from being approved for Bethel’s IP Zone. At last night’s Planning & Zoning Commission (P&Z) meeting, on September 22, 2015, the P&Z denied all applications from B. Shawn McLoughlin to build a crematorium at 12 Trowbridge Drive, in Clarke Business Park in Bethel, CT. McLoughlin wanted to add the structure (actually became 2 buildings in later submissions) to the same property where he operates Mono-crete Step Co. LLC, a cement products company. The decision of the P&Z also includes prevention of any crematoriums in Bethel’s entire IP Zone too, such as Berkshire Corporate Park at 2 Parklawn Drive, Bethel CT. The crematorium issue has been discussed for approximately two years. There were public hearings on April 14, 2015, May 12, 2015, June 16, 2015, July 15 2015, and July 16, 2015, where the applicant gave testimony, submitted building plans, submitted correspondence from business owners, and brought forth a realtor and a representative of the company from which the applicant was purchasing the crematory equipment, to give testimony and answer questions from the P&Z. The P&Z also received public comment and correspondence from residents and business owners at these hearings. Following were three more P&Z meetings on Aug. 8, 2015, Sept. 8, 2015, and Sept. 22, 2015, where during “work sessions” the P&Z discussed matters further. The public could observe these meetings but could not offer comments. 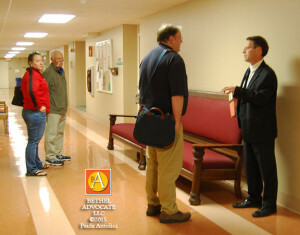 Applicant B. Shawn McLoughlin and also his attorney Peter Olsen refused to give a statement to Bethel Advocate after the meeting. Above photo: Crematorium applicant B. Shawn McLoughlin (2nd from left) and daughter Shelby McLoughlin (far left) stand in the CJH Municipal Center hallway after the crematorium applications were denied by the P&Z. Attorneys for both sides chat after the meeting, applicant’s attorney Peter Olsen (2nd from right) and counsel for Bethel Land Use & the P&Z, (far right) Charles Andres. Reasons given for denying the applications were numerous. See below for some of the resolution statements by the P&Z. The testimony from abutting business owner Greg Marciano, his business Connecticut Coining, located to the north of the proposed crematory location at 10 Trowbridge Drive, was also a factor in the final decision of the P&Z. The testimony included concern that, “the proposed location at 12 Trowbridge Drive will be visible from his property….that the proposed location may affect his businesses ability to retain and recruit qualified employees to work adjacent to the proposed crematory building because it will be in full view from their property…that the adjacent business owner at 10 Trowbridge Drive may rethink investing in and expanding his business by another 10,000 square feet and add new employees in the future due to the location of the proposed crematory in proximity to his property…that his business could be located anywhere in the US an that he doesn’t have to stay in Bethel and a proposed crematory next door could influence his decision not to expand and leave the Park and Bethel.” Marciano said, last night, that he felt that the applicant would likely keep pursuing this cause for years. There was testimony considered by the P&Z “that new owners across the street at 13 Trowbridge Drive would not have purchased that property on April 1, 2015 had they known of the new regulation allowing crematories in the IP Zone and that one was proposed directly across the street….that in all of the negotiations and contract period prior to he sale that the subject of crematory was not disclosed to them by any of the realtors involved in the transaction….that the owners of 13 Trowbridge Drive have not occupied their new building and will not invest the intended $100,000 in the property due to the proposed crematory…that the owners of 13 Trowbridge Drive has placed the property up for sale as a direct result of the potential crematory facility being location directly across the street.” Business owner Mitch Gross was instrumental in past P&Z meetings, in fighting the crematorium in Bethel, with numerous presentations to the P&Z of charts and graphs, regarding his expertise and research in showing the P&Z how the emissions flowed in Bethel using a geographic chart, how detrimental it would be to the public health and welfare, and how property values would be effected negatively. He also thoroughly researched property value studies referred to from individuals on both sides of the issue, and proved that statements made by the applicant’s attorney Peter Olsen, were incorrect. The testimony from John Holbrook, owner of the Holbrook Farm on 45 Turkey Plain Road in Bethel, designated as an organic farm, was also instrumental in the final decision of the P&Z. In the P&Z resolution it states that Holbrook testified that “his designation may be in jeopardy if a crematory is allowed in the Business Park….the prevaling wind travels east from the Park, across Sympaug Pond toward his property and the prospect of toxic particle emissions settlig on the farmland may lead the owner to losing that designation or may create the perception in his customers that the produce and vegetables from the farm are not safe. The owner indicated that he would likely be forced to close his business as a result.” Please note that Mr. Holbrook has been in business for over 40 years in Bethel. The P&Z voted with regard to “Section 8.5.E4, Criteria #4, Suitable Location for Use” of the zoning regulations, which states, “Whether the size of the site, the nature and intensity of operations involved in or conducted with the use, and the location of the site with respect to streets giving access to it are such that the use will be in harmony with the appropriate and orderly development in the district in which it is location and shall promote the welfare of the Town.” The P&Z found that “the applicant has not demonstrated that the proposed location is suitable for the crematory use.” They sited, in part, “excessive amounts of excavation and fill activity required to make this location developable for only a 5,000 s.f. building…the grade must be lowered upwards of 18 feet in some locations….the building will then sit ten (10) feet above the grade of the adjacent street” as some of the reasons to deny this application. A third issue was addressed by the P&Z during the September 22, 2015 work session, a text amendment request by CT Coining Inc., eliminate section 4.3.C .10A crematorium, was approved, but we are still waiting for the official resolution wording on that. This is to take effect by approximately October 1, 2015, after the legal notice is published in newspaper media sometime before Oct. 1, 2015. 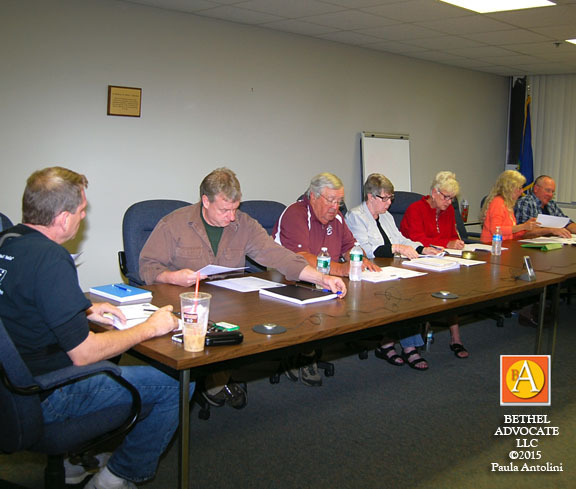 This approval removes the crematorium text entirely from the zoning regulations, and means that no crematoriums will be allowed at all in ALL IP Zones of Bethel, CT.
Bethel Advocate will update you when the legal notices are published, and also will post updates about any future information regarding the crematorium. There is still a pending court case from applicant B. Shawn McLoughlin, MCLOUGHLIN, B. SHAWN v. PLANNING & ZONING COMMISSION OF THE TOWN OF BETHEL Et Al, number DBD-CV15-6017506-S. As of September 22, 2015, there is a scheduled date of October 5, 2015, at 9:30a.m. for a conference proceeding. To read a history of Bethel Advocate stories about the crematorium in the past two years, CLICK HERE. To view the petition and read residents’ comments, CLICK HERE. To join the Bethel Advocate Facebook page, and get daily local news updates and event information via your Facebook newsfeed, CLICK HERE. To read our daily news and events website, CLICK HERE. I know this web site offers quality based articles or reviews and extra stuff, is there any other website which gives these data in quality? Fastidious respond in return of this issue with real arguments and explaining everything on the topic of that. I know this site gives quality based posts and additional information, is there any other site which gives these data in quality? Hurrah, that’s what I was seeking for, what a information! existing here at this webpage, thanks admin of this site. Thanks for sharing your thoughts on bacteria left. here, really like what you are stating and the way by which you assert it. Very great post. I just stumbled upon your blog and wished to mention that I have really enjoyed surfing around your blog posts. In any case I will be subscribing on your feed and I am hoping you write again very soon! Fine with your permission allow me to clutch your feed to keep up to date with approaching post. a taboo matter but typically people do not discuss such subjects. great publish, very informative. I’m wondering why the other experts of this sector don’t realize this. Hello, its pleasant post about media print, we all understand media is a fantastic source of information. Hello colleagues, its impressive article on the topic of educationand completely explained, keep it up all the time. It’s truly very complicated in this full of activity life to listen news on Television, so I simply use internet for that reason, and take the most recent news. user can know it. Thus that’s why this post is amazing. Thanks! I’ll right away grab your rss feed as I can’t find your e-mail subscription link or newsletter service. You have made some good points there. I checked on the net to find out more about the issue and found most people will go along with your views on this web site. afterward you will absolutely take pleasant knowledge. Great website. A lot of useful information here. I’m sending it to several buddies ans also sharing in delicious. the reason that i want enjoyment, since this this web page conations actually good funny stuff too.